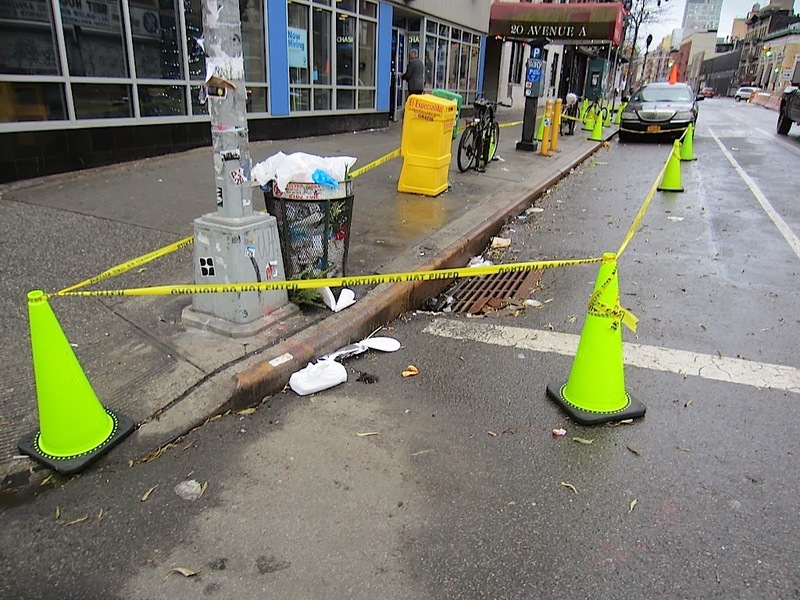 You may have noticed the caution tape up around the manholes and light poles and what not on Avenue A and East Second Street (there are more manholes with caution tape further east on Second Street). One of the ConEd guards sitting in some sort of town car told an EVG reader the reason for this presence: "stray voltage." Dogwalkers- note the dry areas of the sidewalk surrounded by wet pavement. My dog received tremendous electrical shocks walking over the dry pavement in the area outside of the cones. 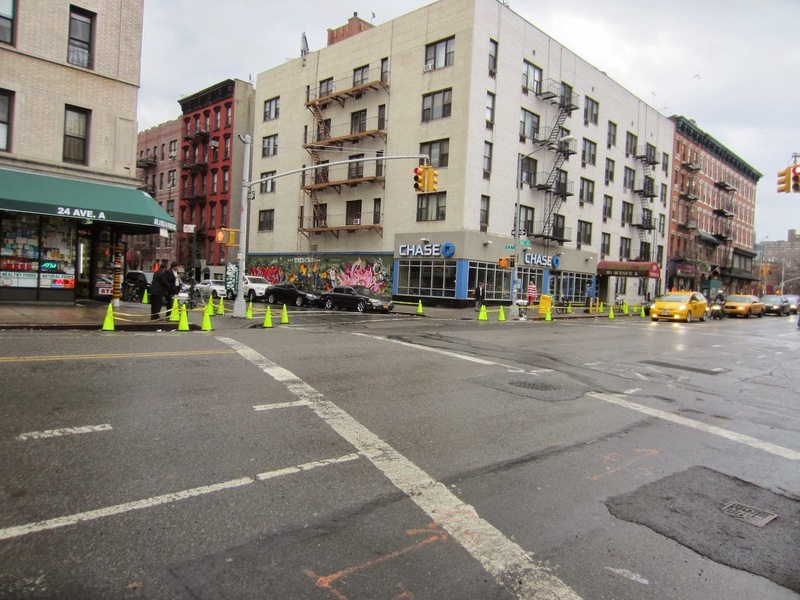 The cones are outrageously inadequate protection from a very real danger. Also on 10th street between 1st & 2nd Ave. I was wondering what this is about. There is no sign or explanation. 1:57, exactly! What kind of 8th world system is this??? 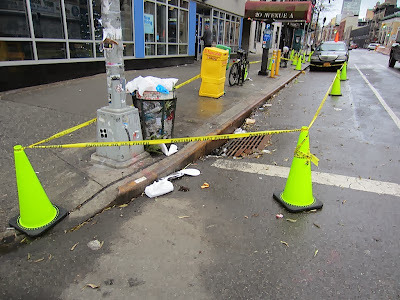 Because Con Ed is unable / unwilling to protect citizens from "stray voltage" the police are now guarding the area on 7th St. between Avenue C and D that has been routinely shocking dogs over the past week. Good catch EVG......FlamingPablum said Stray Voltage was playing out in Hoboken. Oh no... I saw a Facebook post by persons affiliated with the TSP dog run saying that several dogs and people were shocked this week on E 7th; I hope nobody was seriously hurt. 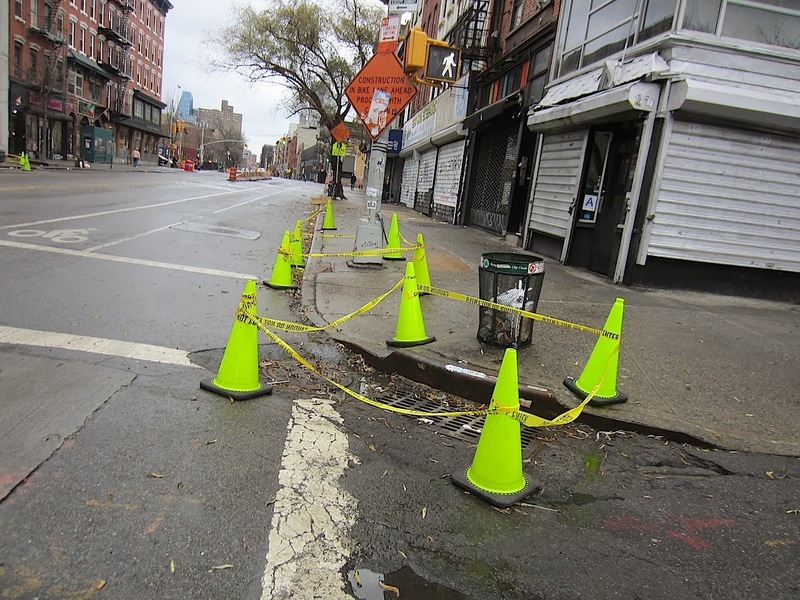 This brings back the thoughts of Jodi Lane and her amazing father, whose tireless activism led to great improvements in the area of sidewalk safety from electric shocks. Could anyone share more info about how dogs react to these shocks? Is it easy to tell a dog has been shocked? I know not to touch my dog if he appears shocked, but just drag him out of the area by his leash. If anyone could share more details about their experience, it could be informative for us neighbors. I'm really sorry this is happening again and hope nobody sustained any injuries. Who cares about the safety of the public/our consumers, when we can jack up the bottom line by deferring maintenance? I wonder why this insanity isn't getting some coverage somewhere?